Chef de cave Richard Geoffroy is not playing it safe with Dom Pérignon. There is a formidable legacy to guard for the region’s first prestige cuvée that carries the name of Champagne’s most mythical figure. But instead of securing it, it is reinvention and pushing the boundaries that recur in Richard Geoffroy’s deeds. He is obsessed with progression. ‘If you are a defender, you are already a loser. To me the major pitfall of champagne is repetition, which is often done in the name of consistency’, he states as we sit across each other at the ascetic and airy second floor tasting room at the abbey of Hautvillers, the ancient home of the monk Dom Pérignon. Exchanging over a flight of Dom Pérignons, I am rewarded with fireworks of his insightful and opinionated say. 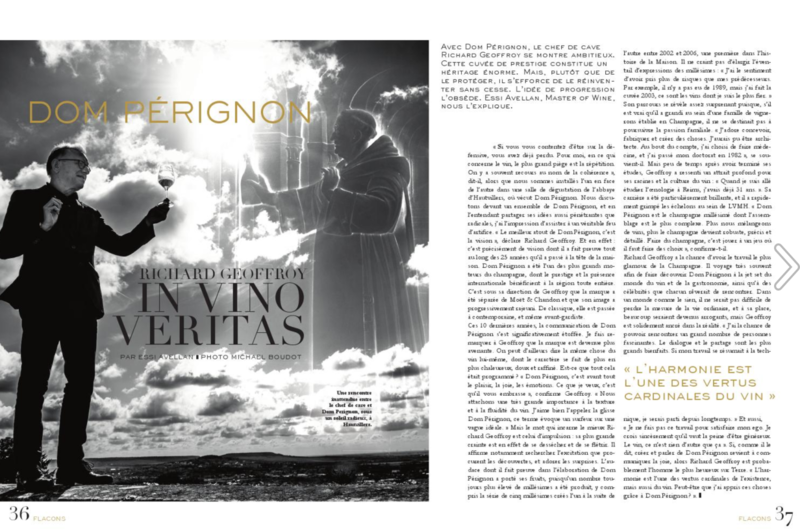 ’Dom Pérignon’s greatest asset is vision’, Richard Geoffroy decides. It is easy agree with that, as vision is exactly what Geoffroy has demonstrated during his 25 years at the head of the house. Dom Pérignon has been a major driver of champagne, whose prestige and global presence benefit the entire region. Under Geoffroy’s wing the Dom Pérignon brand has been separated from Moët & Chandon and its image has gradually been rejuvenated from classic to contemporary, even avant-garde. 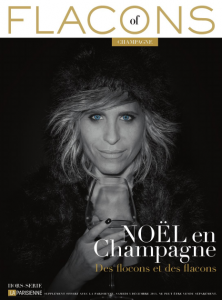 The last 10 years have seen a notably more communicative Dom Pérignon. I remark to Geoffroy that the Dom Pérignon brand has become friendlier. And the same goes even with the wine with its increasingly welcoming, polished, and seamless character. Was this visioned? ‘Dom Pérignon is all about pleasure and joy, emotions. I want it to embrace you’, Geoffroy agrees. The multitude of research and development carried out at Moët & Chandon has benefited Dom Pérignon quality, too. A friend of a less technical way of talking about wine, Richard Geoffroy often sounds more like a poet than a winemaker: ‘We pay a lot of attention to the texture and flow of the wine. I like to call it the Dom Pérignon glide, reminiscent of the surfer riding the perfect wave’. There is also an element of surprise in his career path, as even if he comes from a family of vine-growers in Champagne, winemaking was not his first choice. ‘I love designing, building and creating things. I could’ve been an architect. At the end I chose medicine and passed my doctorate in 1982’, He remembers. However, soon after his studies, Geoffroy felt a strong attraction back to his roots, to winemaking: ‘I was already 31 when I went to study oenology in Reims.’ Since then Richard Geoffroy’s path has been highly successful and advancement rapid at LVMH. As a lot of creating and construction takes place when crafting champagne of this quality and quantity level, no doubt he is also drawing to his work from his other life interests: ‘Dom Pérignon is the most blended vintage champagne. The more wines we combine, the more robust, detailed and precise the wine can be. Champagne making is an options game, and I love options’, he confirms. Geoffroy has an unusually reflective and mature perspective on life. Highly respected by his colleagues, he is known as a great mentor who will give opportunities to develop. ‘I think knowledge and skill are best given forward. If you share them with others, the whole project will grow. I am not on an egotrip. I really believe generosity pays off, and that’s what wine is all about’, he reasons.